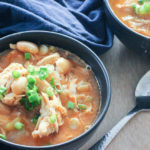 This Healthy Buffalo Chicken Chili (with creamy white beans!) 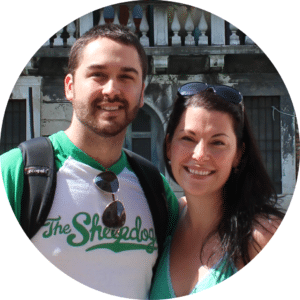 is easy and healthy – and a fun twist on traditional chili. It’s comfort food that’s quick enough for a weeknight dinner, and it’s freezer-friendly too! When I was a kid I wasn’t a huge fan of chili for some reason, but as an adult I’ve grown to love it. 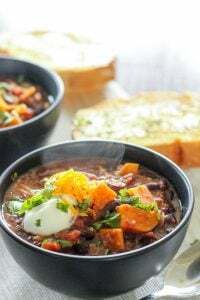 I love all the different flavour combinations you can apply to it, I love the hearty combination of beans and meat (or other protein), and I love that it’s cheap, easy to make and freezes well. Really, chili ticks all the boxes of what I love in a meal. 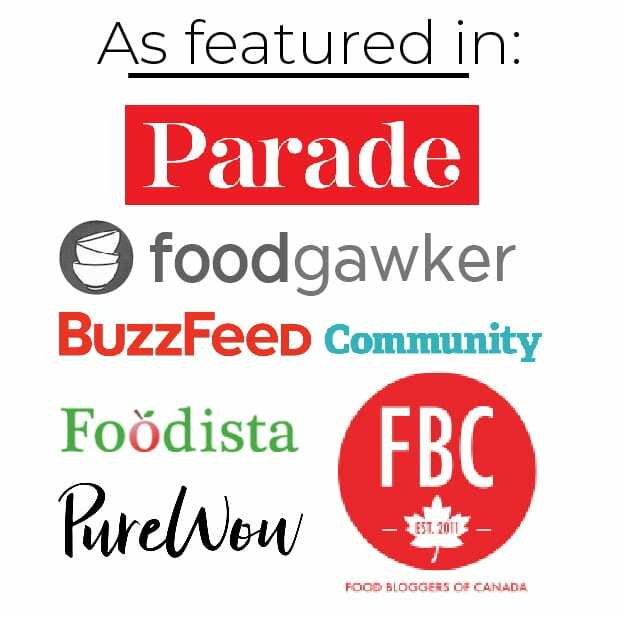 Anyway, it seemed like high time to share a chili recipe on the actual blog and I started thinking about fun flavour combinations. 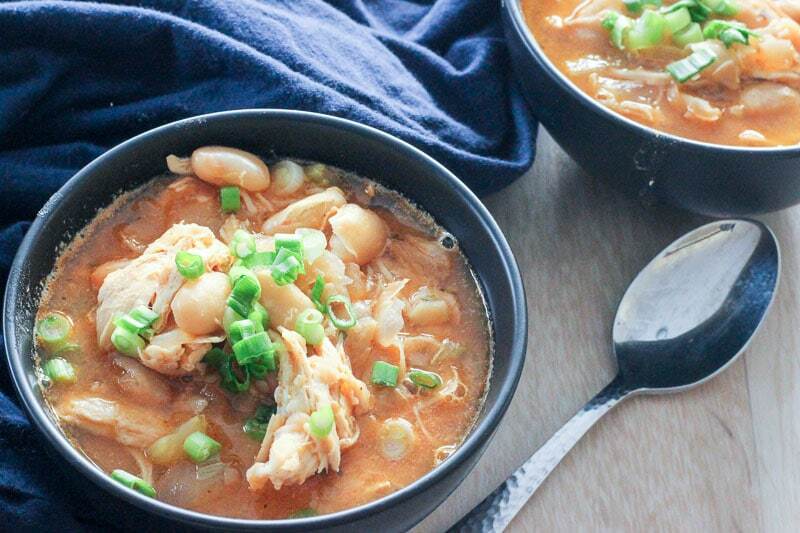 Buffalo chicken chili came to mind right away. 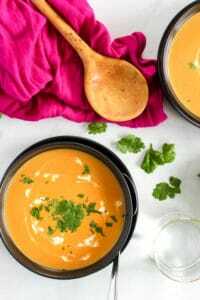 There’s something so tasty about food that combines spicy hot sauce and cooling ranch (or blue cheese – but in this recipe I used ranch). 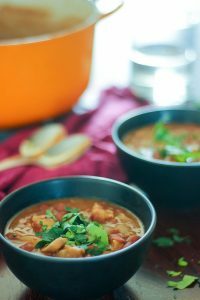 This is a really easy chili to make – as are all my chilis. I just don’t like to over complicate things. 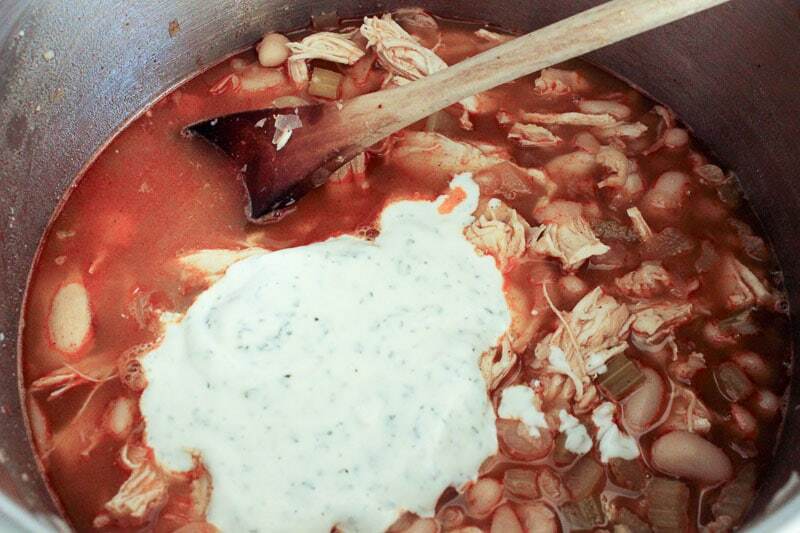 It uses just two chicken breasts, 2 cans of beans and a bunch of spices, sauces and aromatics. Half the beans get mashed up to thicken the chili. Don’t forget the add-ons at the end – I really like the flavour pop the lime juice adds, and if you like spice, a final little splash of hot sauce is always a good idea. 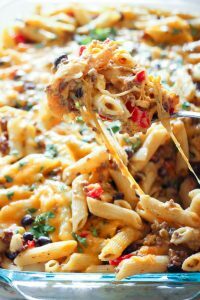 This is a nice quick chili and an easy weekday dinner. If you have leftovers, you can freeze them for lunches or an even faster dinner later! It’s win-win! Heat a large pot over medium heat. Add 2 tablespoons of olive oil to the pot. Peel and dice one onion into small pieces, add onion to the oil and saute for a few minutes, until it starts to soften. Chop 3 stalks of celery and mince 5 cloves of garlic. 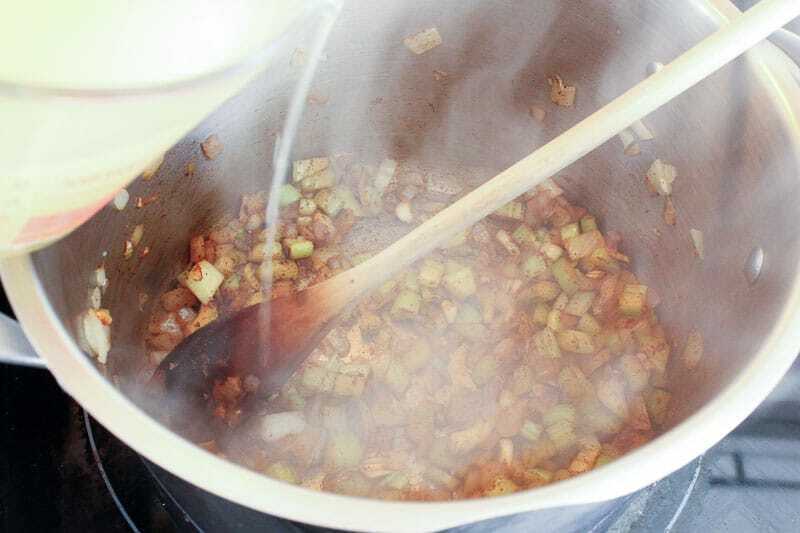 Add to pot and saute until celery softens slightly. Add 1 teaspoon of chili powder and 1/2 teaspoon of salt and stir well to combine. Slowly add 4 cups of chicken broth (I love Better Than Bouillon), scraping the bottom of the pot with a wooden spoon to scrape up all the browned bits. Add 1/4 cup of Frank’s Red Hot Original Sauce and stir to combine. Nestle chicken breasts into the liquid so they’re covered as much as possible. Put the lid on the pot, increase heat and bring to a boil. Then reduce heat and simmer for 20 minutes, or until chicken internal temperature reads 165 degrees F on a meat thermometer. Take chicken out of pot and use two forks to shred it. Return it to the pot. 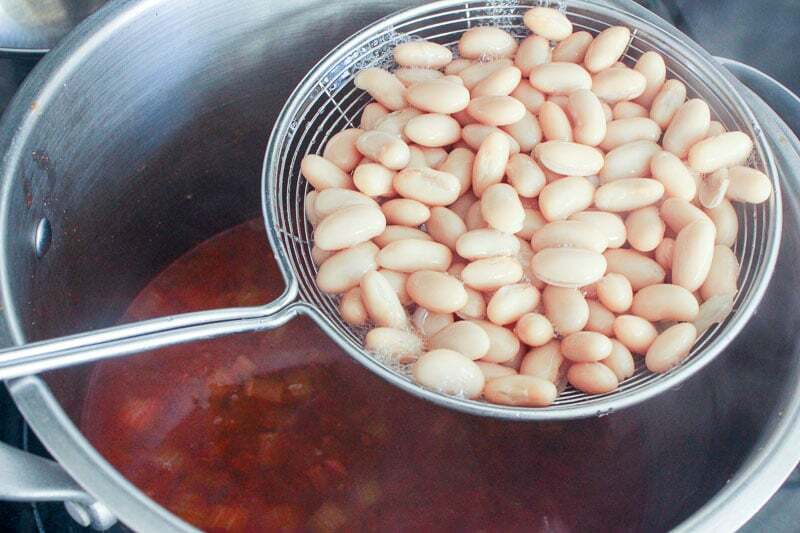 Rinse and add 1 can of white kidney beans (or navy beans) to the pot. Rinse the other can of beans and put them on a plate. Use a fork to mash them up, then add them to the pot. 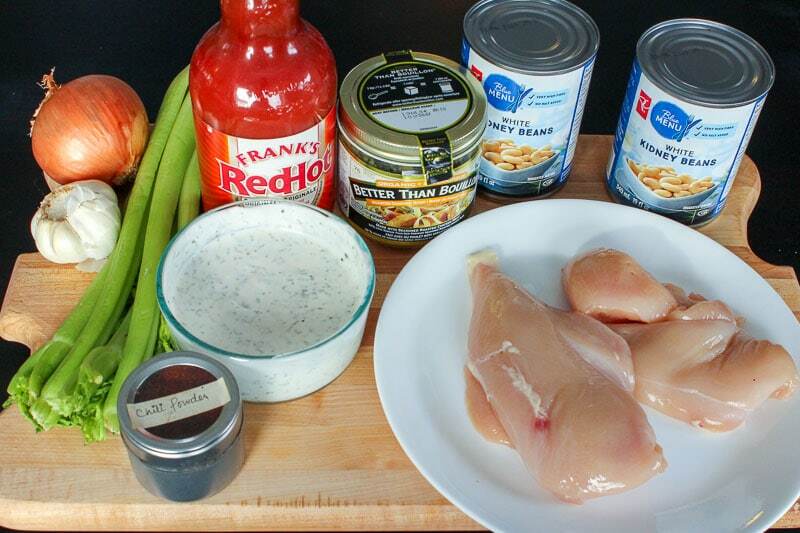 Add 1/2 cup of ranch dressing (you can use our homemade ranch dressing mix to make your ranch so it’s healthier), one more tablespoon of Frank’s Red Hot Sauce. Let it simmer for 5 minutes so flavours can meld. Taste for seasoning and add more salt if the flavours aren’t popping. 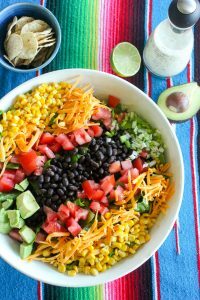 Serve with a big squeeze of lime juice (not optional) and chopped green onions or even cilantro (optional). 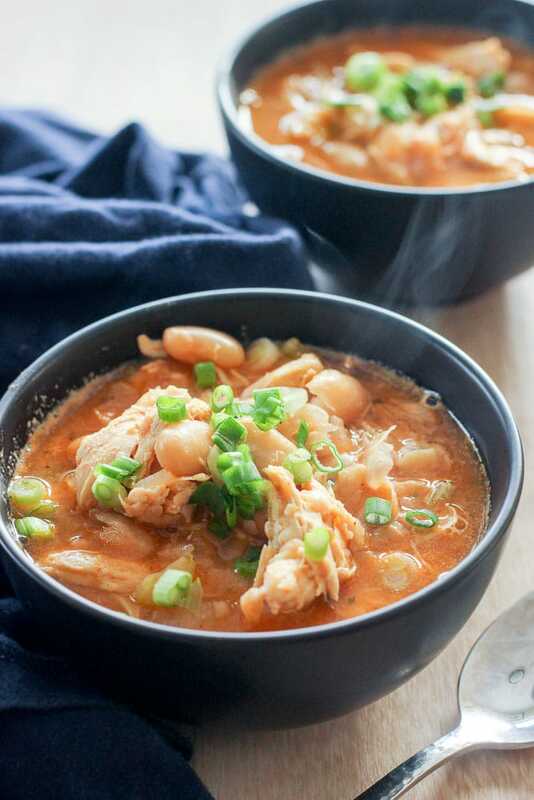 This Healthy Buffalo Chicken Chili (with creamy white beans!) 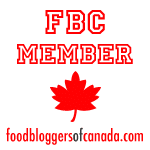 is easy and healthy - and a fun twist on traditional chili. It's comfort food that's quick enough for a weeknight dinner, and it's freezer-friendly too! Heat olive oil in a large pot over medium heat. Chop onion and add it to the pot. Saute for a few minutes until it starts to soften. 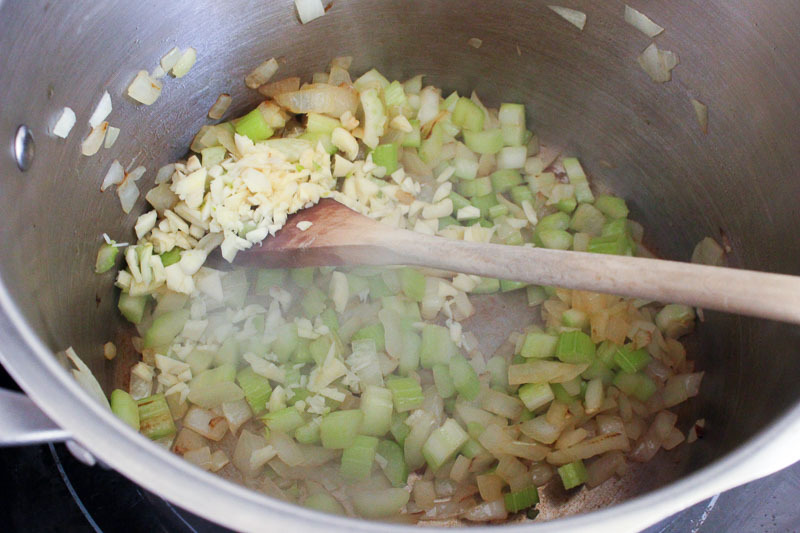 While onion is cooking, chop celery and mince garlic. Add to onion and cook for a few more minutes. Add chili powder. Slowly start to add chicken broth (a few tablespoons at a time) and use a wooden spoon to scrape the browned bits from the bottom of the pot. Once you've scraped off all the browned bits, add the rest of the broth, the salt, the 1/2 cup of Frank's Red Hot Sauce and nestle the chicken breasts into the liquid. Cover, increase heat and bring to a boil. 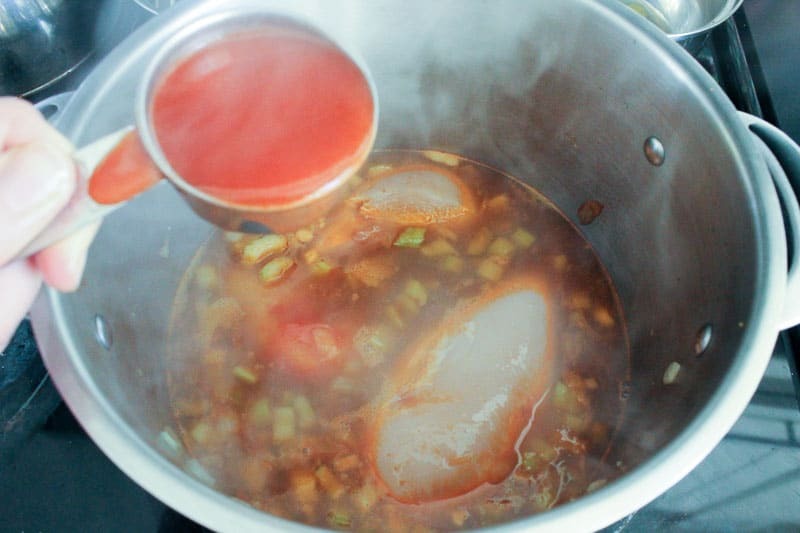 When it reaches a boil, reduce to a simmer and cook for 20 minutes. After 20 minutes the chicken should be cooked (confirm with a meat thermometer - it should read 165 degrees F in the thickest part). 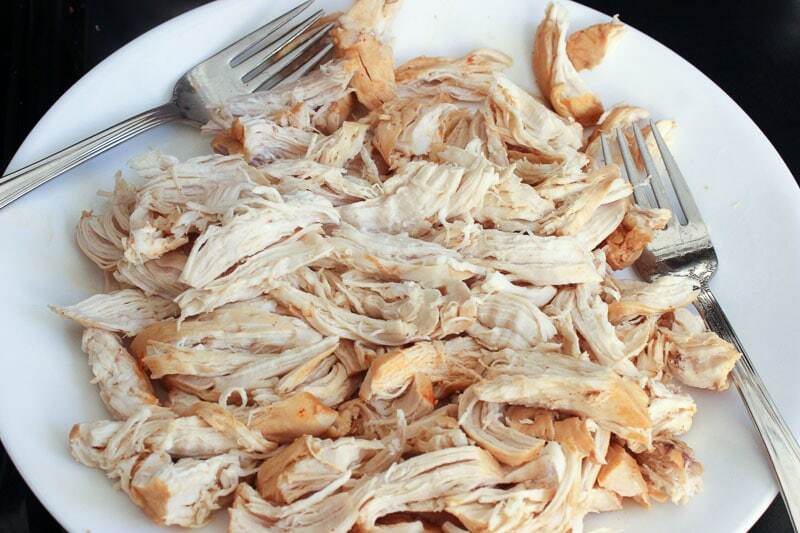 Put chicken on a large plate and use two forks to shred it. Return to pot. Drain and rinse one can of beans and add to the pot. Drain and rinse the other can of beans and spread them out on the plate you just shredded the chicken on. 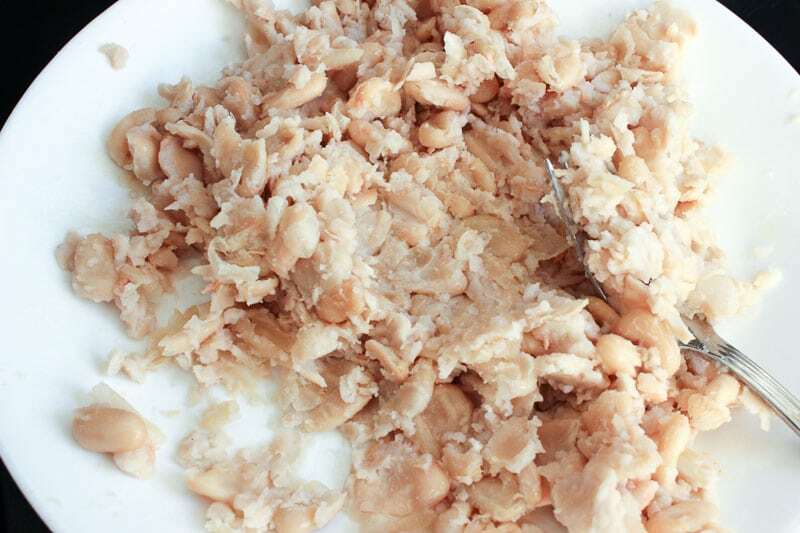 Use a fork to mash the beans into a paste. Add to pot. Add ranch dressing and final tablespoon of Frank's. 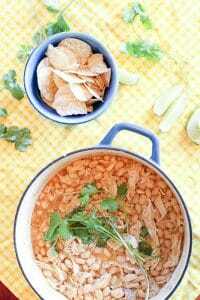 Serve hot, with a generous squeeze of lime juice in each bowl. You can also top with traditional chili toppings if you want to (cilantro, green onions, tortilla chips, cheese, etc). 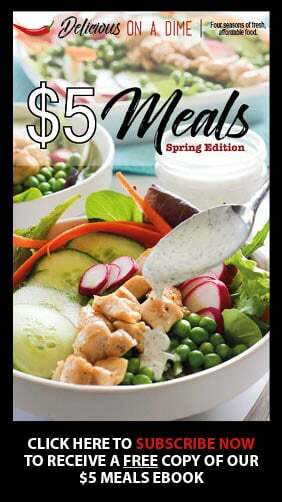 *Try our homemade ranch dressing mix to make your ranch if you want an option that's a bit healthier. 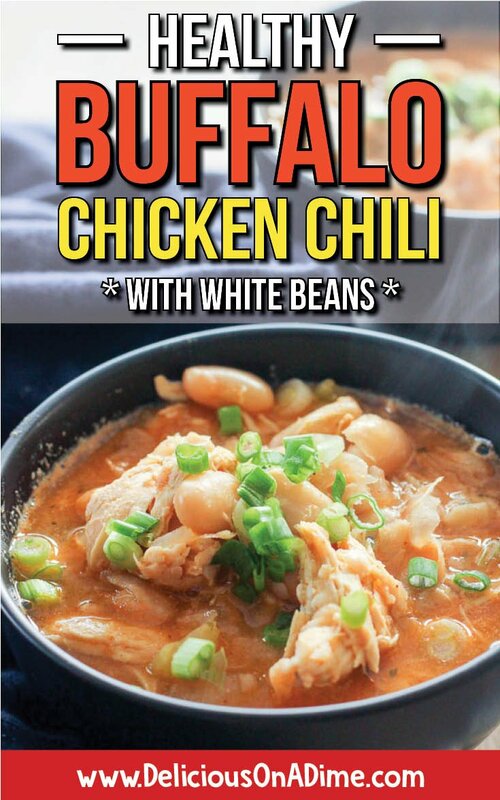 I love traditional chili and I didn’t realize that I could change it up with white beans and cooked chicken. The hot sauce gave it the kick it needs. If you’re looking for a healthier version – this is a must-try recipe.